If you are wondering what causes different colors in cockatiels and how all the different mutations happened, then keep reading. So, What Causes Different Colors In Cockatiels? It took a really long time of people owning cockatiels before one of the many tens of thousands of captive-bred cockatiels appeared that was a very different in color from the rest. As far as we know the first cockatiel mutation to come about was the pied or harlequin. It would have been possible for the normal-looking parents of this pied to have continued producing other pieds in the approximate ratio of one pied to three normals. Likewise, the offspring of this pied when mated back to their grandparents, the original pied parent, or between themselves, would have produced more pieds. If a sudden change in appearances happens like that, it is called a “sport” and if a sport can be perpetuated through subsequent generations it is called a genetic mutation. Are All Mutations Due To Genetic Factors? When studying what causes different colors in cockatiels, it is clear that by no means are all color changes in birds due to genetic factors. For example, if parrots are fed on a diet of sunflower seed with no extras, as they moult, some feathers may grow back that are yellow or white instead of the usual green or black. 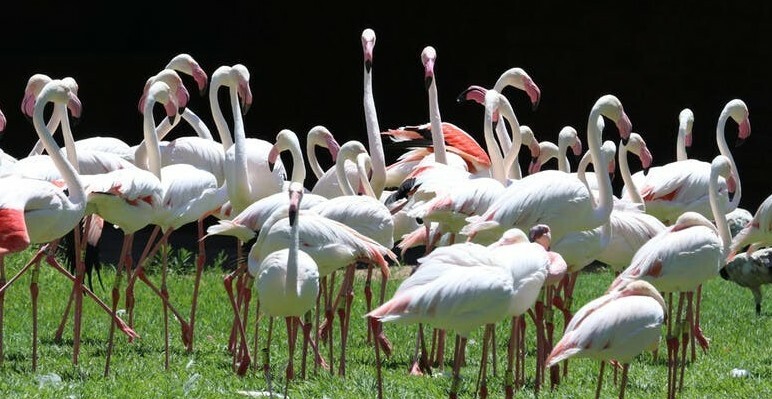 Similarly, if the food of a pink flamingo has no carotenoids, which come from plants, then it will moult out to have white feathers and pale legs. These two color changes above are nutritional and reversible. Once the diet is corrected, these birds in their subsequent moults become normally pigmented. The young of these nutritionally deprived birds, assuming that during their period of rearing they are given a satisfactory diet, will not have the abnormal coloring of their parents. The majority of color mutations are from the bird having a genetic error or a defect somewhere in its body’s chemistry. This makes it unable to synthesize the usual pigments. Such color changes as these mutations create are therefore the consequence of a biochemical deformity. It would be most exceptional, though certainly not impossible, for a color mutation to be the result of a process “added” rather than “subtracted” from the bird’s already existing metabolism. As with so many mutations, these color mutations are recessive to the dominant wild-type. This simply means that if cockatiels with these novel colors are pared to normals the offspring look exactly like the wild-type with no hint that one of the parents had a different color. Even though the wild-type may dominate completely, the mutation is not lost. When these young are mated with each other or back to differently colored parents, they will produce some of the visual mutants for themselves. In Avicultural literature, the normal-looking birds that carry the mutation are known as Splits, which is much less of a mouthful than the geneticist’s wording of heterozygotes. My Grandmother had a cockatiel and it was the most amazing colored bird. I really didnt know there were so many types of them. I found the point really interesting that if the nutrition intake is not correct, it can effect the pigment of their feathers! It must be essential to have the right bird feed for cockatiels in order for them to maintain their colours, would I be right in saying? Overall great article and really interesting. Thanks Ronan. I also found it quite amazing that the quality of the food that you feed a cockatiel affects the coloring. First about the pet of my grandchildren, the Cockatiel parrot, who has been living for 5 years and talking. We did not notice a change in color.I became interested in the topic of the article. After all, the story of the domestication of parrots is very deep. This story is intertwined with scientific observations. The Cockatiel science of color genetics deals with the heredity of color changes in the feathers of this species. About fifteen primary color mutations have been established in species that allow for the production of many different combinations. It should be remembered that adult Cockatiel is sexually dimorphic. Color in cockatiels comes from two pigments: melanin (which provides gray in feathers, eyes, beak and feet) and lipochromes (which provide yellow color on the face and tail and orange color of the heel on the cheek). Melanin gray overlaps yellow and orange lipochromes when they are present. Thanks for adding all this value to my article Mark. I have now learnt something new too. Very interesting this article. I thought there were always different colored Cockatiels. I wonder if one can change the color of all birds with giving special diet. After reading this, I think it is probably pretty hard to make new colored tribes of Cocktiels. The ones in the pic look really nice and special. The next time I visit a shop I have to look at some and see what colours they have there. Messing with their diets is seldom a good idea. I would rather go and buy a cockatiel mutation or two and breed with those for the best and easiest results. I did not hear about these parrots but they look beautiful to me. 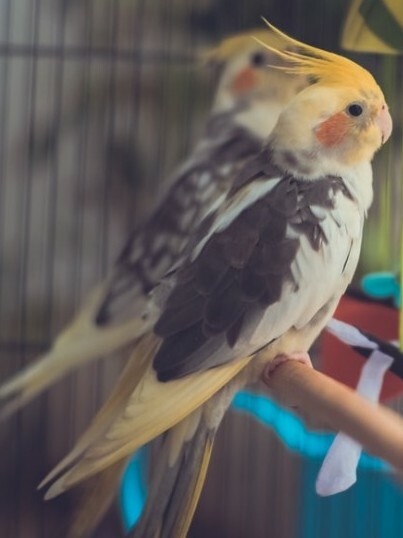 It is fascinating that there are currently twenty-two cockatiel colour mutations established in aviculture with eight being exclusive to Australia. One-day-old cockatiel chick looked quite strange for me. It is hard to believe that these birds can grow so much and so nice. No wonder, that they have so many mutations and different colours. I have also heard that a cockatiel is the most popular companion bird. But at the same time, it surprised me that this bird can be feisty. I also found out that multiple names for mutations have arisen due to the use of different names in different locations for a single colour variation. That means it is a different name but not a different mutation. Thanks for an interesting post about cockatiels parrots. Thanks for your interesting comments Tomas. It can be quite daunting remembering all the different mutation names and what they look like – I quite agree.